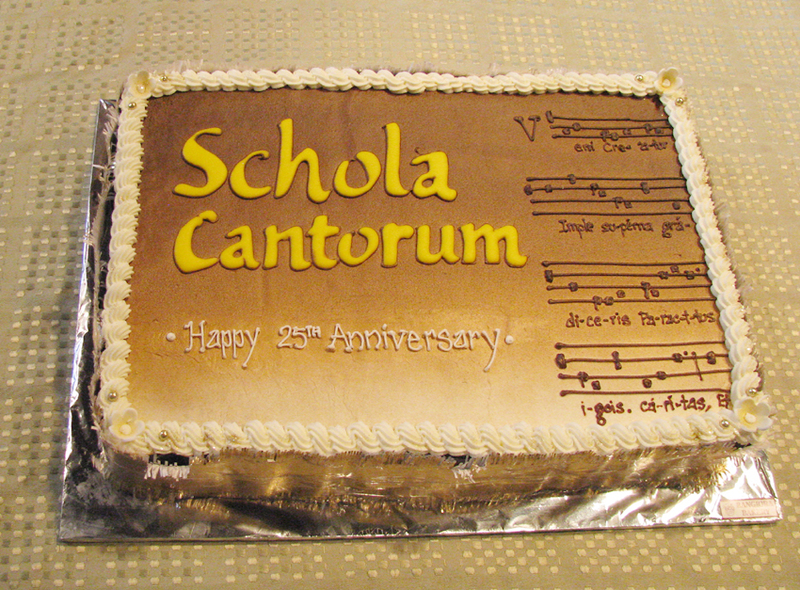 Schola Cantorum of Christchurch celebrated its 25th anniversay with a concert featuring all its past and present conductors. Schola Cantorum of Christchurch performed in Darfield under its musical director, Roger Buckton, who was thrilled to be able to bring this notable 25 voice Christchurch City choir to Darfield. As guest conductor, Jodie Phaal, a student of conducting at the University of Canterbury’s, School of Music also conducted and David O’Beirne, another senior student at the School of Music sang the solo tenor part in The record of John by Orlando Gibbons. Darfield organist, Hugh Stevenson accompanied The record of John as well as another fascinating Gibbons composition, The street cries of London. Elegy for a fallen city is a compelling piece about Christchurch the earthquake city and received its first Darfield performance in the programme together with a performance of a spoken fugue arranged by Roger Buckton entitled 26 reasons to love Canterbury. Apart from these contemporary songs, the choir performed from its more traditional Renaissance repertoire, both sacred and secular. 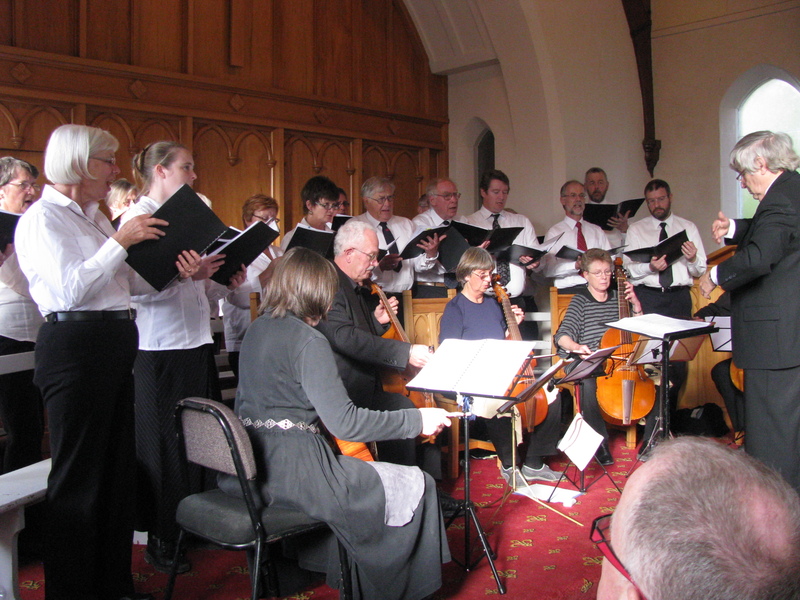 Schola Cantorum of Christchurch performed in Hampden, under its new conductor, Roger Buckton. David O’Beirne, a senior student at the School of Music, sang the solo tenor part in The record of John by Orlando Gibbons. The Canterbury-Otago Consort of Viols consists of six leading viol players from Christchurch and Dunedin. These players meet three times a year to work at and enjoy the rich and fascinating viol repertoire from the 16 and 17th centuries. The viol is a six string fretted instrument played between the legs, as a cello, (da gamba). The three typical sizes are treble tenor and bass and these were all in action in Hampden. Rhona Lever and Roger Buckton played treble, Donald Moorhead and Gay Peek were on tenor and Jo Fielding and Aart Brusse provided the bass line. The day included a welcome at 2pm to Hampden for the Choir and Consort from His Worship the Mayor, Mr Alex Familton, a discourse on Mr John Hampden – The Patriot (1594-1643) from historian Ken Bridge, followed by a short informal concert introduced by Roger Buckton. In the morning, from 10.00am to 12.30, the viol consort rehearsed in the hall and the choir in the church and members of the public could drop in on those sessions at any time. Following afternoon tea from 4.15 – 5pm there was a Big Hampden Sing for anyone to sing some Hampden repertoire with members of Schola Cantorum. Printed music was provided. Music in Elizabethan and Jacobean England was an established part of life and for the gentry, part-singing, playing the viol and spinet went alongside pastimes such as dancing, tennis, bowls and hunting. Queen Elizabeth herself was an accomplished keyboard player and her Father, Henry VIII has several compositions credited to his name. Even the first ship (Mayflower) to sail around the world contained a room to house a chest of viols to be played by the officers in the evenings. Nothing has been discovered about Sir John Hampden’s musical accomplishments and interests but we can be certain that music would have been part of life at his Buckinghamshire Estate, Hartwell. In 1613, Hampden, aged 19 was in his last year at university. Orlando Gibbons (1583 – 1625) was a Gentleman of the Chapel Royal serving the King, although he does not seem to have had a hand in composing music for this royal wedding. William Byrd, by this time in his 70th year had also been at the Chapel Royal but by then, was resident in the country in Essex where he was actively composing and publishing his music. Both Byrd and Gibbons were revered composers of their time and must have been known to John Hampden. Byrd had a prolific output of about 470 compositions including choral church music, madrigals, keyboard and viol music. Gibbons’ output was significantly less, but there are some favourites which are perhaps some of the most well known of the period, eg The Silver Swan and the Record of John. The final two pieces have nothing to do with Hampden! Elegy for a fallen city is a compelling piece about the earthquake city and received its first Hampden performance in the programme together with a first performance of a spoken fugue arranged by Roger Buckton entitled 26 reasons to love Canterbury. They are performed as a reflection by the choir of the Canterbury earthquakes 2010/11.